Drawn carriages are as representative of the Viennese landscape as the Saint Stephen’s Cathedral and the Giant Ferris Wheel. 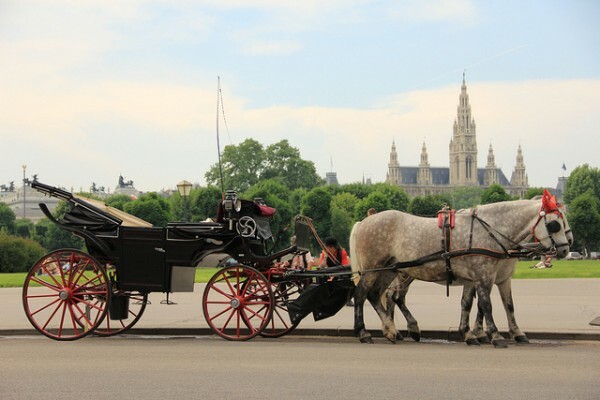 A journey with carriage pulled by two horses is considered to be the best experience by many tourists. There is hardly a more convenient way to discover the beauty of Vienna. The term horse carriage (fiacre) comes from French and refers to the parking place of carriages for the passenger transport in the city, from Rue de Saint Fiacre, Paris. In 1721 the carriages called “Janschky” received the name “fiacre” (and were also numbered). The carriages had a great success, between 1860 and 1900 in Vienna were circulating over 1,000 carriages. Coachmens were often true public notorieties that occasionally appeared on stage as a singer. They were especially appreciated for their discretion in the case when one or another prestigious gentleman had fun with a lover behind the cab curtains. Probably the most famous of them was Josef Bratfisch the personal coachman of Prince Rudolf, who brought his girlfriend Maria Vetsera in 1889 to Mayerling, where their lives met a tragic end. 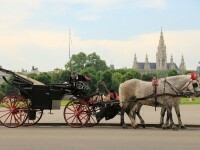 Today you cannot imagine the Viennese cityscape without drawn carriage. The parking places can be found in various parts of the city: at the Saint Stephen’s Square, at Heroes Square (sometimes at Michaelerplatz), at Albertina Square, at Petersplatz Square and at the National Theatre in Vienna (Burgtheater). A short ride of about 20 minutes in the Old Town costs 55 EUR, and the longer ride of about 40 minutes on the Ringstraße Boulevard and in the Old Town costs 80 EUR. 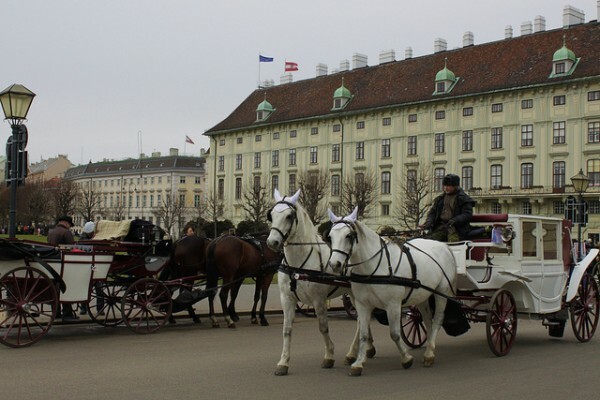 You can also book individual drawn carriage tours in Vienna directly from the companies offering carriage transport. 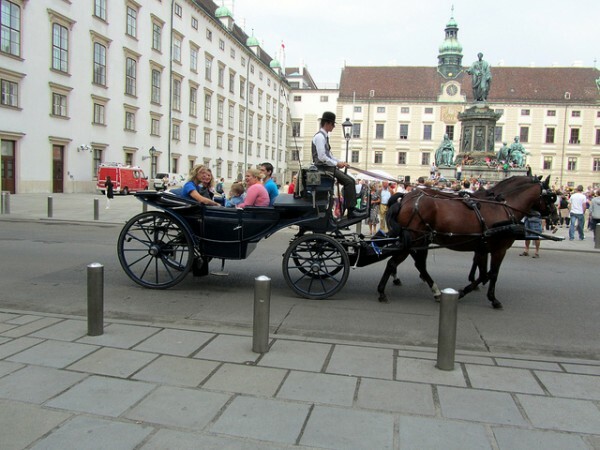 Beginning with the spring of 2012 were also included carriage rides to Zentralfriedhof (Central Cemetery). 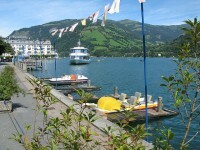 The parking place at gate 2 is occupied from Thursday to Sunday from 10 am to approx. 4:30 pm. 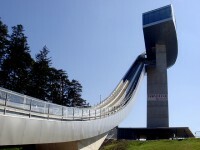 The tour passes by many tombs of famous personalities from Vienna as Mozart, Schubert, Beethoven, Hans Moser, Falco, Adolf Loos and others and also brings visitors close to the natural beauty of the area. A short ride with drawn carriage of about 30 minutes costs 40 euros; a long ride of about 60 minutes costs 70 euros (for 4 people). The tours begin from April and continue until the end of September. Those who want a romantic atmosphere may require the coachman a “Porzellanfuhre”, that is a special ride with a very quiet and steady tempo. Formerly this was a safe way to transport valuable porcelain from one place to another. Nowadays can be an original way to enchant your boyfriend / girlfriend.